Official Football Manager Hints and Tips which are applicable across both the full FM PC game mode and FMC. 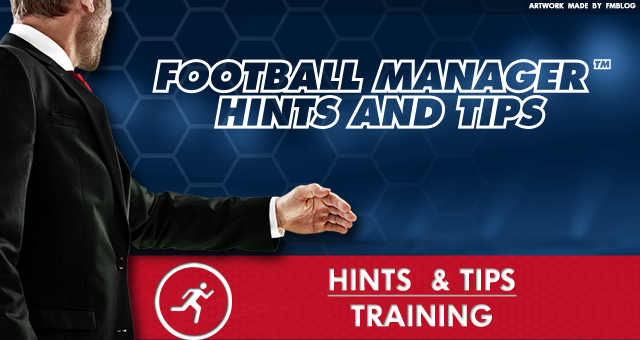 Let's take a look at Training Hints and Tips for FM. Players who are very versatile are more likely to successfully retrain to a new position. Players who are very versatile are less likely to lose new positions they’ve learned through retraining when they’re not playing or retraining the position. When managing a semi-professional club, it’s a good idea to try and tie down key players to full-time contracts to maximise their training time. Staff on part-time contracts have less time to train players than full-time staff. Intense physical training is best carried out in pre-season, before the domestic season is under way. Too much intense physical training during the season is likely to tire your players out faster and increase the risk of injuries. Player’s attributes will naturally decrease during the off-season, when they are away on holiday or doing very little training. The strength training category covers a player’s natural fitness, stamina, strength and work rate. The aerobic training category covers a player’s acceleration, agility, balance, jumping, pace and reflexes. The goalkeeping training category covers a player’s aerial ability, handling, kicking, throwing and one-on-ones. The tactics training category covers a player’s anticipation, decisions, positioning, movement, team work and command of area. The defending training category covers a player’s tackling, marking and concentration. The attacking training category covers a player’s passing and creativity. The shooting training category covers a player’s finishing, long shots and composure. When assigning coaches to training schedules, take care not to overwork them. Even the best coaches can’t give the players the attention to detail they want if they’ve too much to do. Remember that your youth players are still developing and as such will tire quicker. Be considerate with your workloads when devising youth schedules. Youth team coaches only train youth players, they do not work with or train senior players. Goalkeeping coaches work with and train both senior and youth goalkeepers. Fitness coaches work with the senior and youth players, but only deal with the physical aspects of training. First-team coaches only work with and train the senior players, they do not work with or train youth players. General coaches work with and train both senior and youth players. Retraining a player to play in a new position can be a cost-effective way of providing additional cover for your team without having to make a new signing. When training players for lower league clubs, it would be important to focus more on the physical aspects such as pace and stamina. Football Manager training hints and tips that will help you with training your youth and senior players.